Happy Memorial Day! 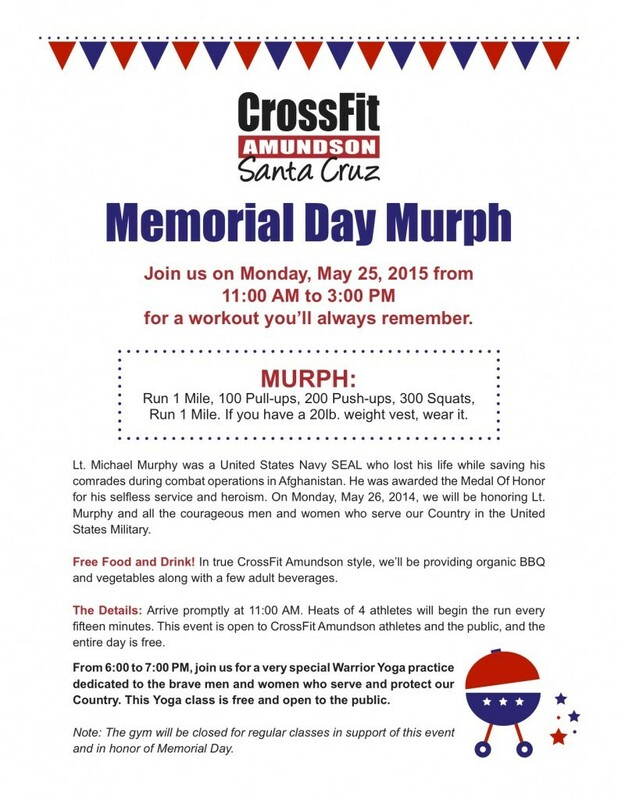 Please note our gym will be hosting the 3rd Annual Memorial Day Murph Workout and BBQ today from 11:00 AM to approximately 2:00 PM. This event is free and open to all CrossFit Amundson Athletes and their families. We will be offering several modifications to the workout to ensure all levels are able to participate in the fun and challenge. The Workout Brief takes place at 11:30 AM and the first heat begins at 11:45 AM. All current and former Military and Public Safety are encouraged to complete the workout with “Boots and Utes”. If you’ve got a side dish to share – bring it! Note: Full workout brief to include strategies, modifications and explanations to take place at HQ at 11:30 AM. Please note all regular classes and programs are cancelled in support of Memorial Day Murph. Santa Monica Police Department’s SWAT Team was the first Team in the Country to establish Murph as their entry-level SWAT qualifying workout. This year, inspired by Santa Monica, the St. Lucie County Sheriff’s Office (Florida) SWAT Team will use Murph as their test, and will “compete” against Santa Monica SWAT. Dave Castro, of CrossFit HQ and CrossFit Games Director, will be on “Team Santa Monica” and Greg Amundson, CrossFit LEO Liaison, will be on “Team St. Lucie.” The teams will compete for fastest overall Murph with 1 year of bragging rights as the grand prize. Stay posted for updates on the day of the event!